Krupabai Satthianadhan (1862-1894) wrote her semi-autobiographical novel Saguna: A Story of a Native Christian Life ago about a girl growing up in a very different culture to mine – and yet over 125 years later her story so resonated with that of my own family. Her mother told her: “What is the use of learning for a girl?” All that a girl needed to know was how to cook and look after the home for her future husband1. In England in the late 1950s the wife of a primary school head teacher told my mother: “Don’t send her to the grammar school – it’s not worth it because she’ll only get married.” My mum was so proud that I had also passed the 11-plus exam and could go to the local grammar school, just like my two older brothers. And she was determined that I would have the same opportunities in life as they had. 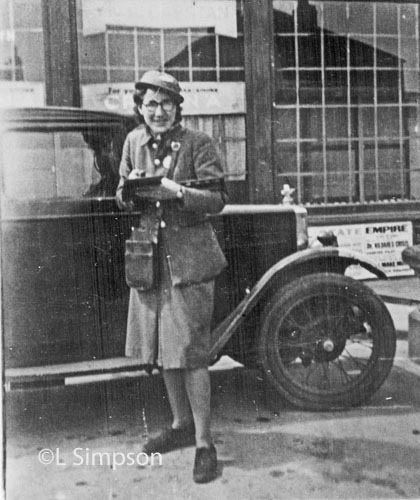 In my eulogy at her funeral I recounted: “As a small girl at a school in Northfleet, Kent in the 1920s my mum dreamt of being allowed to indulge in her love of learning to the full and so live an interesting life. 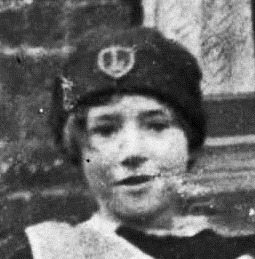 For her, however, that was a forlorn hope for she and her five sisters came from one of the poorest families in their neighbourhood.” Pictures: My mum as a schoolgirl; and as a war time clippy. At that time formal education in England ended when children were 14-years-old and her parents could not afford the cost of allowing any of their six daughters to go on to further education. Instead she went to work and then married when she was 19 – an experience shared by millions of girls in many countries today2. My mum was determined to pass on her dream to her children. I can remember when I was between five and eight-years-old sitting around the stove in the kitchen in the evening listening spellbound as she read classics like The Adventures of Tom Sawyer and Treasure Island to me and my brothers. In our working class neighbourhood it was socially unacceptable for even my brothers to go to grammar school, let alone me as well. We experienced a lot of ostracism once we donned the grammar school uniforms. But it wasn’t as tough as in India in the 19th century as Krupabai explained in Saguna. She described how Indians feared a learned woman believing that this meant she had the ability to converse with spirits. When the husband of one such woman died she was accused of being in league with evil spirits – even though her husband was 35 years older than she was. As a young wife she was then expected to commit suttee – by being burnt next to her dead husband on his funeral pyre. Saguna (like Krupabai) was able to study because her parents had converted to Christianity and her eldest brother especially encouraged her. Her passion for learning led her, however, into contact with the alien culture of the western missionaries. She soon found that if she did not obviously comply with their middle-class evangelical ways she would be reproved for not being spiritual enough. I too found it difficult to be accepted by middle-class evangelicals because like Saguna I did not practise those outward aspects of Christian spirituality that they expected. In the 19th century many missionaries could be accused of being culturally insensitive. Mary Ann Aldersey was an excellent example. But, as I witnessed when working overseas with relief and development agencies, Westerners can still be very insensitive about how they try to bring about change in Africa and Asia. In the West it was found that the provision of education and employment opportunities did lead to the empowerment of girls and women – the very freedom of choice and action that my mother had yearned for. But that model doesn’t work so well in non-western societies where there are strong social and cultural limitations on women3. What those 19th century female missionary teachers did do, however – despite often being firm believers in Western cultural and colonial imperialism – was to provide role models for the girls they taught. Once Saguna and her Western teachers had forged a better understanding of each other she could state: “A magic wand seemed to have touched and transformed everything around me. The institution appeared quite different ….. Just a minute before it had seemed as if there was nothing for me to do; now what a world of untried work lay before me, and what large and noble possibilities seemed to open out for me! I would now throw aside the fetters that bound me and be independent. “I had chafed under the restraints and the ties which formed the common lot of women, and I longed for an opportunity to show that a woman is in no way inferior to a man. How hard it seemed to my mind that marriage should be the goal of woman’s ambition, and that she should spend her days in the light trifles of a home life, live to dress, to look pretty, and never know the joy of independence and intellectual work! She certainly did not feel, however, that she had to give up her own culture. She indignantly rejected a young Indian man, who after studying in England, felt the only way forward for Indians was to become completely Westernised. And for Krupabai there was obviously a deep sense of relief when she lodged with the Rev W S Satthianadhan and his wife Anna. Satthianadhan met her at Madras station when she travelled there to become the first Indian woman to study medicine at Madras University. She immediately recognised a father-figure in him. In the Satthianadhan’s son, Samuel, Krupabai found a young man who, despite his British university education, was happy to be an Indian. He also encouraged her to find intellectual fulfilment. Ill health stopped her from furthering her career in medicine but not from writing – and with Saguna she became the first Indian woman to write a novel in English. Their happy marriage was cut short by her early death in 1894. Sadly today in India millions of women are illiterate. It is estimated that two thirds of the world’s 880 million illiterate adults are women4. The Western missionaries who pioneered girls’ schools in India, China and also in Africa, showed that, despite their cultural disorientation, education was vitally important in the empowerment of women. And the same could be said for the middle class teachers at my mum’s school in Northfleet. It is also sad that today many children in England today don’t make the best of the formal education on offer to them. Peer-pressure can certainly play a part in that as can parents. My mum was warned that we might move away – and we did. Others may fear that their children will have aspirations “above their situation” and so look down on them. As Krupabai showed in Saguna it helps so much if someone in the family encourages a child to learn. 1. Saguna: A Story of Native Christian Life, edited by Chandani Lokugé, New Delhi, Oxford University Press, 1998, pages 21, 24,25,131, 147, 152,153. 2. In this century an estimated 51 million adolescent girls aged between 15 and 19 in the developing world are married according to Sanyukta Mathur, Jeffrey Edmeades, Sreela Das Gupta, Anju Malhotra and Dipankar Bhattacharya in their paper: “The Tie That Binds – Early Marriage and Women’s Empowerment in Two Indian States”. 3. Malhotra, Anju and Mark Mather, 1997 “Do Schooling and Work Empower Women in Developing Countries? Gender and Domestic Decisions in Sri Lanka”, Sociological Forum 12 (4): 599-630.